Northern Caribbean University (NCU) has entered into an agreement with the Caribbean Examinations Council (CXC®) to accept the CXC Associate Degree as fulfilling partial credit requirements toward a course of study. In addition, NCU has agreed to award transfer credit to students having Caribbean Advanced Proficiency Examination (CAPE®) certification. The details of the agreement between both organisations are contained in a memorandum of understanding (MOU) signed on Monday (April 1) by NCU President Dr Lincoln Edwards and CXC Registrar and CEO Glenroy Cumberbatch during a ceremony at the university’s Mandeville Campus. Mr Cumberbatch noted that NCU was “first out of the blocks” in recognising CXC’s associate degree for advanced standing in some of the institution’s progammes. 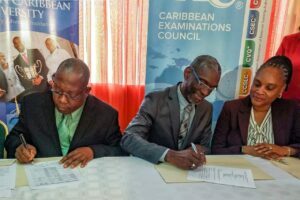 Describing the signing of the agreement as a “major milestone”, the CXC Registrar said that allowing students with the CXC associate degree to receive exemptions for certain courses and programmes offered at NCU would facilitate the completion of their Bachelor’s degrees in a shorter time. He pointed to the additional advantage of students who could spend four years in at NCU gaining bachelor’s as well as graduate degrees. In welcoming the agreement, NCU President Dr Lincoln Edwards said it was another step in the institution’s more than century long tradition of providing opportunities for higher education to those in need. He argued that, through this agreement, NCU was being supportive of the national agenda of expanding the number of persons receiving tertiary education from 15 per cent 46 per cent. Dr Edwards noted that the agreement with CXC would help to ease matriculation to higher education for many persons. He pointed out that students must have a minimum 2.5 cumulative grade point average in the CXC Associate Degree programme to be considered for transfer and admission to NCU.